BRUSSELS - Greece's hopes to finally get its bailout and dodge default next month were boosted Friday, when key European leaders, including German Chancellor Angela Merkel, sounded confident a deal could be reached. The leaders of Germany, Italy and Greece are "optimistic" the 130 billion euro ($170 billion) rescue package can be cleared next week, a spokesman for Merkel said Friday after the three held a conference call. Hours earlier, the French prime minister warned against letting Greece default. That means the euro currency union's main powers are now pushing toward resolving the uncertainty hanging over Greece at a meeting of eurozone finance ministers on Monday. Agreement on the bailout, which comes on top of a 110 billion euro ($145 billion) rescue granted in 2010, has been delayed for months due to doubts over Greek political leaders' commitment to tough new austerity measures as well as the worsening economic situation in the country that kicked off Europe's debt crisis two years ago. Some eurozone governments' caution over handing out more money to Athens had investors wondering whether Greece would be forced to default and leave the euro instead. After days of confusion, Germany - the main bankroller for the bailouts - made it clear it wanted to see Greece's deal through. "The three leaders are optimistic that the finance ministers can find a solution to the pending questions at the Eurogroup on Monday and thereby contribute to the stabilization of Greece," Steffen Seibert said in a statement, after Merkel, Italian Prime Minister Mario Monti and Greece's Premier Lucas Papademos held a conference call earlier Friday. Papademos later also called Dutch Prime Minister Mark Rutte, whose country is one of the biggest bailout skeptics. Greece is under big pressure to get the green light on the bailout so it can move ahead with a related 100 billion euro ($130 billion) debt-relief deal with private bondholders that will take several weeks to implement. That deal has to be completed before March 20, when Athens faces a 14.5 billion euro bond redemption it cannot afford. 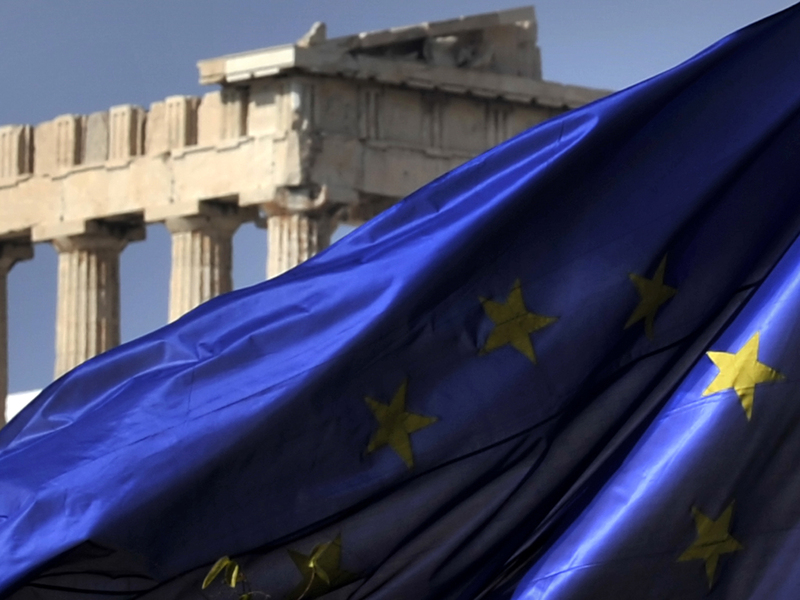 Tensions between Greece and the rest of the eurozone hit new highs this week as politicians in Athens and other European capitals blamed each other for the problems related to the bailout. Seven people were detained Friday following an anti-austerity protest in which eggs were thrown at the German embassy in central Athens. But French Prime Minister Francois Fillon warned that the fallout of letting the country go up in financial flames would be far-reaching. "We must do absolutely everything so that there is not a default by Greece, which would be dramatic for Greeks themselves and dramatic for Europeans," he said on RTL radio Friday. Now that the Greek Parliament has approved austerity measures demanded by international creditors and banks have agreed to help in the bailout, "the Europeans must now honor their commitments. That is the position that France is defending," Fillon said. Some European politicians have downplayed the effects of a default by Greece, but Fillon called that "totally irresponsible." The last issues to resolve before a bailout is rubber-stamped include making sure the aid program brings Greece's debt down to a sustainable level and setting tighter controls on Athens' spending decisions. Germany and several other countries want Greece to set up a form of escrow account - separate from the main government budget - that would give priority to servicing Greece's debt over spending on government services. The European Commission, the EU's executive, is working on several options for such an escrow account. An EU official said that, among several options, the Commission is looking at a "transit account" through which Greece's bailout money would be funneled. The account would have a "hierarchy of payments," with servicing the country's debt at the very top, the official said. He was speaking on condition of anonymity because the details of the plan are still in flux. The official said there was "a critical mass" of euro countries in favor of such an account. He also said Greece was not in a position to challenge the plan. "It's part of it (the bailout deal) as long as some delegations want it to be," he added. The eurozone also still needs to decide on additional measures to bring Greece's debt down to 120 percent of economic output by 2020 - the target leaders defined when they tentatively agreed on more aid in October. The current plan, which includes the 130 billion euro bailout, the 100 billion euro debt relief and the new austerity measures, would leave Athens' debt close to 129 percent of economic output at the end of the decade. The International Monetary Fund and the eurozone believe such a high debt load would be unsustainable without outside assistance. Meanwhile, Athens took the first concrete steps toward making sure that a small number of holdouts cannot scupper the debt relief deal it has negotiated with private investors. The Greek parliament is expected to soon introduce so-called collective action clauses in its outstanding bond contracts. The CACs would force holdouts to participate in the planned bond swap as long as a majority of investors approve. As a prelude to the debt swap, the European Central Bank has started exchanging its holdings of Greek government bonds for newly issued bonds of the same value, according to a eurozone official with knowledge of the matter. Those new bonds would not be retrofitted with CACs, protecting the ECB from being forced into the swap deal. The ECB bought around 55 billion euro ($72 billion) worth of Greek debt in 2010 as investors dumped the country's bonds and interest rates soared. But because bond prices were already low at the time, analysts estimate the ECB spent only around 40 billion euro on its holdings. The exchange, expected to be completed by Monday, does not address the issue of whether the ECB would forego the profits on its Greek bond purchases to help close the financing gap in the new bailout program. Bank officials have said they could simply return any investment profits to national governments, which could then do what they wanted with the money.